If you are crafty – you must already know about Craftsy.com! And if you don’t… well… consider yourself informed! I can’t say enough about this fantastic site. 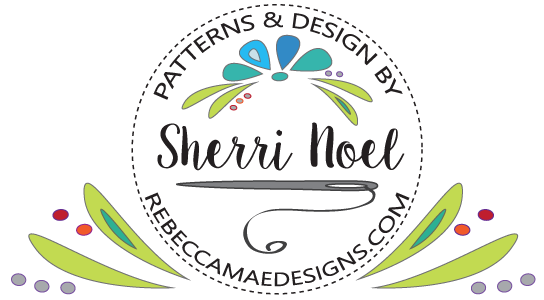 There are 10 Lessons in this class that will cover Sarah’s deconstruted piecing method, needle turned applique, wedge ruler designs, a step down piecing quilt lesson, sewing curves and more! Let’s take a look at my ADORABLE sampler from her class… I needed a baby blanket for a friend so I combined a couple of the MANY techniques she offers in this fabulous class to suit my needs… including blocks from her deconstructed ‘dolly’ quilt (perfect for my baby blanket). I labeled some of the techniques you can learn in this class so you won’t miss anything! 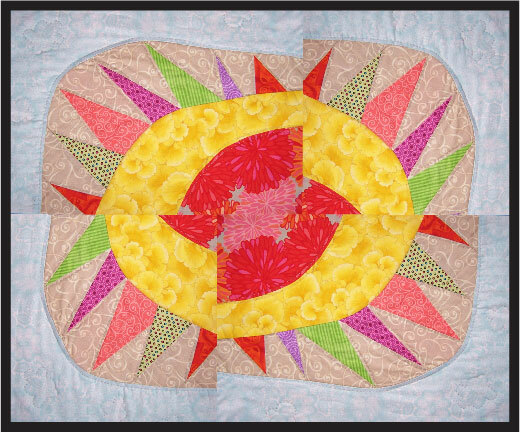 You’ll be surprised to know that this quilt was almost made entirely without a ruler! I didn’t measure any pieces! It’s quite fun as your not worried about accuracy – it’s all intended to be wonky and FUN! Sarah also offers a pattern in one of her books for a quilt made with these sweet flowers that I made for my dolly quilt. 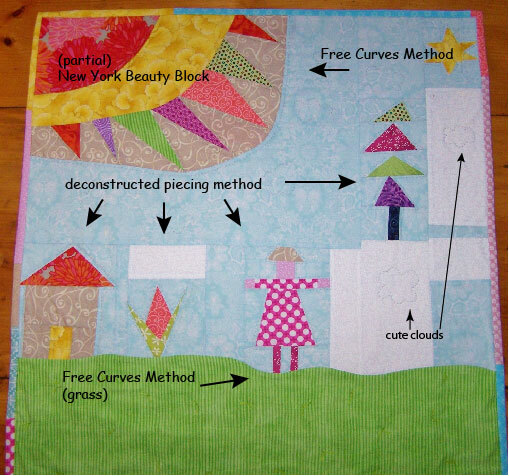 I played around with the partial New York Beauty Block in photoshop to show you how you could put together the entire wonky block – As explained and demonstrated in this course. 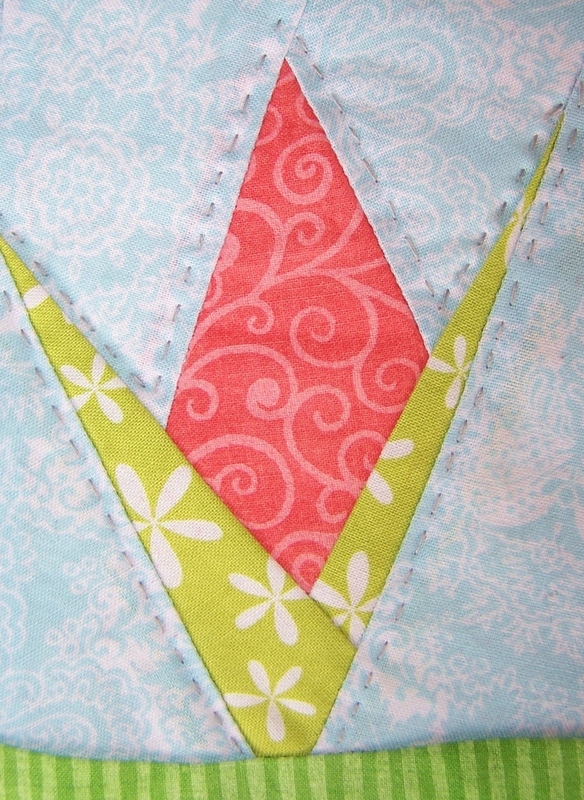 I tried one of her needle turned applique methods in this quilt row I’m making as part of a row ‘robin’ with my quilt guild! This was the first time I took an online course AND worked along with it . I watched the entire 10 lesson course first and decided what I wanted to make, then I reviewed the parts I wanted to return to – Sew easy on the Craftsy platform! And last but not least – if you want a sneek peek at how a craftsy class might look, and Sarah’s teaching style ~ Check out Sara’s free tutorial on hand quilting – I was pretty excited to find it~ notice her dolly wall hanging (on table) and flower quilt in background! Enjoy! And if you have any trouble with the discount link – please comment below and I’ll get right on it! And a quick News Flash! 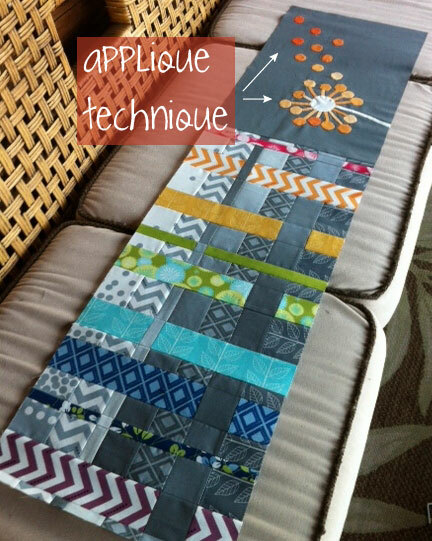 Check out this Free Craftsy Block of the Month Video Class! If you sign up by January 31, 2013, using this link, you’ll automatically be entered to win a course kit with 11.5 yards of Robert Kaufman fabric, a $100 value – AWESOME! Thank you for the link to the class I have signed up I love craftsy too.